I’ve been hanging on to two products that have been burning a hole in my pocket pantry: Cloister Honey Bourbon Honey and Palmetto Farms Stone Ground Grits. The first product has been sitting on my shelf for a while. I have four other jars of Cloister Honey that I’ve been working my way through and was holding off on opening this flavor until I made more of a dent in my other honey. But when I mentioned that there was bourbon honey in our pantry to Brad and it just happened to be infused with his very favorite bourbon, Woodford Reserve, I later found him eating the honey out of the jar with a spoon. In other words, if you like bourbon, you’ll love this stuff. It really tastes like bourbon. 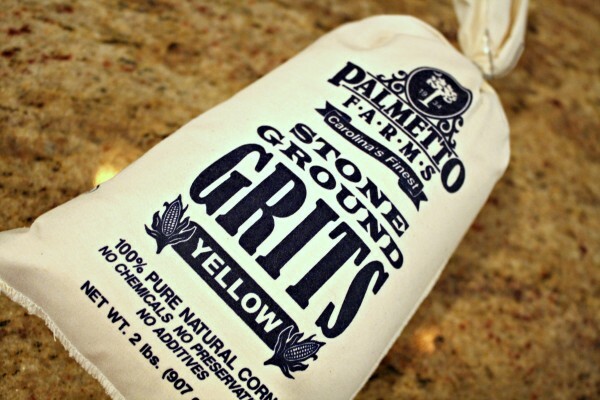 The second product, Palmetto Farms Stone Ground Grits, is a little more of a recent find. I dropped into the Gluten/Allergen Free Wellness Event last weekend to interview Chef Peter Pollay of the gluten-free Asheville restaurant Posana Cafe. While I waited, I checked out some of the vendors, one of which was Palmetto Farms. They drew me in with their hushpuppies and after chatting with one of the owners for a bit, I was given this sack of stone ground grits to try free of charge. I’ve actually been eating a lot of grits lately 1) because I really like them (especially mixed with a scrambled egg and a bit of cheese) and 2) because they’re a great source of iron, which is great for pregnant ladies like me. I put these two products to work and ended up with a delicious dish that I served to Brad and a friend with some very vinegary bok choy. The pork chops were the hit of the night with their wonderful subtle sweetness from the honey — they were definitely my favorite part. The grits dish was simple, but satisfying and a nice change from the other grains and “carby” sides that I usually serve. With no butter or cream, the grits became the perfect grits consistency — velvety smooth. Stone ground grits are much better for you than instant (which I’m sometimes guilty of eating when I’m in a pinch) because they’re less processed. They’re also heartier and more likely to fill you up for a while, much like the way steel cut oats does versus instant oatmeal. In a small bowl, stir together mustard and honey until thoroughly combined. Sprinkle pork chops on both sides with salt and pepper. Warm olive oil in a large pan on medium heat. 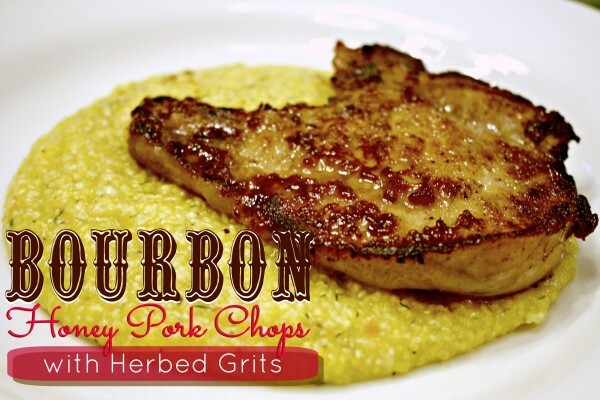 Brush pork chops on one side liberally with honey mustard mixture and place honey mustard side down in the pan. 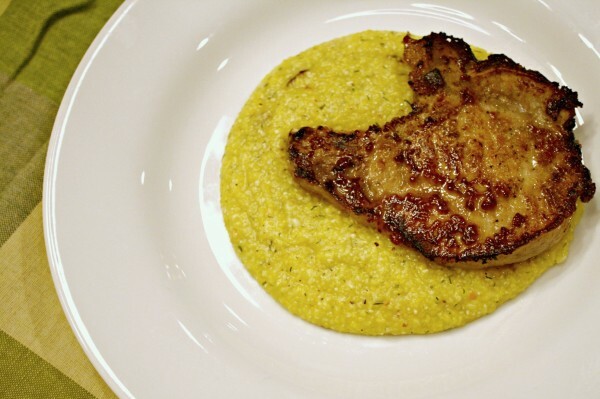 While one side cooks, brush the remaining mixture liberally over the side facing up of the pork chops. Cook each side until golden brown (about 4 minutes each). Place in a low temperature warm oven or plate and cover with aluminum foil to keep warm until serving. Bring water and bouillon cube to a boil, then add grits. Lower temperature and cook for 20-25 minutes or until grits are smooth and have absorbed almost all of the liquid. Add spices and 1/2 teaspoon of salt. Taste and add more salt to taste, 1/4 teaspoon at a time, stirring well each time. 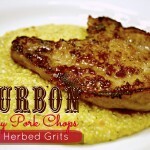 Plate grits and serve each serving with one pork chop placed on top of the grits. Capitol Hill Seasoning from Savory Spice Shop is a spice blend of dried shallots, salt, pepper, dill weed, parsley and chives. You could obviously make a blend of these spices instead of purchasing this product, but I really think that its worth the money. It’s a great spice blend for all types of dishes. You can substitute the water and bouillon cube used in the grits ingredients for 4 cups of vegetable or chicken broth.